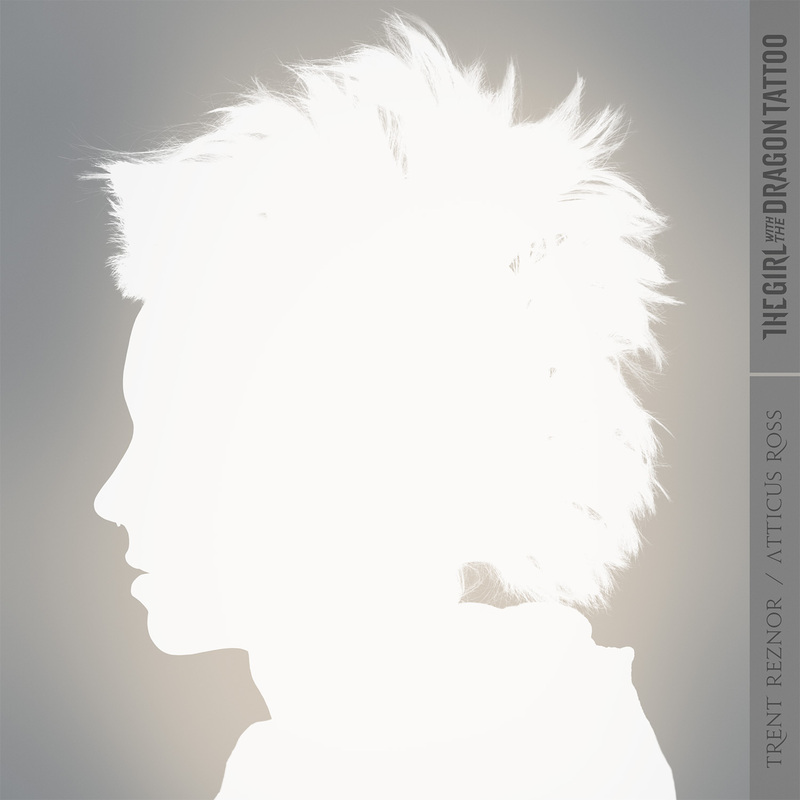 I think Trent Reznor and Atticus Ross may be my new favorite contemporary film composers. At least, that’s my gut instinct after the duo write my favorite score of the year two years running. Last year, Reznor – he of Nine Inch Nails fame – and Ross collaborated to score David Fincher’s “The Social Network,” creating a bold new experimental sound that gave the film a potent sense of immediacy while redefining the power of ambiance. I’ve listened to that soundtrack album more times than I care to count, and I wasn’t the only one who took notice – even the Oscars, not exactly known for awarding work that breaks the mold (which is why “King’s Speech” won Best Picture and not “Network”), gave Reznor and Ross a 100% deserved Academy Award for Best Original Score. To begin, let’s discuss the presentation of the album, because it’s quite impressive. Most soundtracks deliver a condensed version of a film’s score, designed to fit onto a single CD (eighty minutes or less). Perhaps using their Oscar clout, Reznor and Ross have opted to go in a different direction, releasing their entire, uncut compositions, a 39-track, 173-minute magnum opus that is fifteen minutes longer than the film itself. It will be packaged on three CDs when the physical version comes out on December 27th, but today, you can purchase the soundtrack digitally via iTunes or directly from the Nine-Inch-Nails store, the method I personally would recommend as you can, for the same price as iTunes, get the album in a higher bitrate (I personally paid the extra two dollars to buy it in Lossless Audio – 44k CD quality – which, given the nature of the sound, is well worth it). Suffice to say, it’s an extraordinarily comprehensive album. Not only does it include every last second of the score, but is bookended by two vocal tracks, one of which should already be familiar to audiences: the album opens with “Immigrant Song,” the Led Zepplin cover (sung by Karen O of the Yeah-Yeah-Yeahs) created for “The Girl With the Dragon Tattoo” teaser trailer. Thanks to this relentless, spirited recording, that teaser quickly became one of my favorite film previews ever, and I’m very happy to see the full, uncut song appear on the soundtrack. It’s an absolutely mesmerizing piece. The album ends with “Is Your Love Strong Enough?,” a cover of the Bryan Ferry original by Reznor and Ross’ side project, How to Destroy Angels, that I assume will play during the film’s closing credits. It too is quite good. But it’s the material in-between these tracks that is of most interest, and as I said above, I have no hesitation in calling this the best film score of 2011, even without having seen the movie. In fact, it’s easily entered the upper pantheon of my favorite film scores, and trust me…I listen to a lot of soundtracks. That being said, I cannot guarantee others will feel the same way. The sound for “The Girl With the Dragon Tattoo” is bold, brave, and experimental, always exploring new musical envelopes and never attempting a sound that could be called conventional. There are few recognizable instruments heard here; instead, it is a collection of electronic sounds, ambient noise, and numerous sonic elements I cannot describe. It’s impossible to tell where most of the sound comes from (one prominent ‘instrument’ sounds like a beat up tin can being beat inside a room with lots of reverberation), but Reznor and Ross know exactly what they are doing with all of it, arranging all this noise into precise, captivating compositions. Part of what makes the score work is that Reznor and Ross clearly have a strong understanding of musical theory. If they didn’t, how could they so effectively subvert and play with the conventions? The only prominent recognizable instrument (besides drums) is the piano, which many tracks are built around. The piano can be described as a key basis for music itself, so building these compositions around the piano gives the score an incredible sense of musicality, of clear and engaging melodic structure. As crazy as the score gets, experimental and wild and often rambling, there is order, an instantly identifiable base that gives the music shape. Even when the piano isn’t present, Reznor and Ross’ musical mastery is always on full display. To me, the most brilliant thing about the music is that most of the pieces are built around singular, simple riffs: a melody, a motif, a phrase, a cadence, a drum break, or even just a simple, random sound. Not unlike Beethoven’s 5th, where the melody is played, broken down, and then rebuilt, Reznor and Ross take this musical idea, whatever it may be, and twist, build, and play with it over the course of the piece, layering new sounds on top of it, deconstructing and reconstructing the initial sound, or simply going in haunting, hypnotizing circles, always ringing absurd amounts of sonic power out of such simple phrases. “Oraculum,” the album’s absolute best track, is a perfect example of this, a drum break that, over the course of seven minutes, becomes an epic, sprawling, heart-pounding race; “Hidden in Snow” is a calmer but no less brilliant example of the same concept – this time built around a gritty chime – while “Pinned and Mounted” provides a forceful demonstration of the composers’ profound musical skill. There are two other kind of tracks present: one is all about forward momentum, action and thrills usually built around drums, while the other is ambient: slow, contemplative, and meandering loops of experimental noise. The ambient tracks may test some listeners’ patience, as they are the most overtly avant-garde. I myself was on board for all of it; the ambient tracks play an essential role in creating the atmosphere of the score’s sonic landscape, and some are brilliant in their own right (“Perihelion” or “Under the Midnight Sun,” for instance). Part of what makes the soundtrack’s presentation so riveting is that it’s entirely gapless – the tracks all bleed into each other, and the transitions are flawless. It is, essentially, one giant piece of music, and no single track is expendable. The ambient pieces set the mood, clean the palette, prepare us for the next big composition; they complete the musical tapestry. It’s hard to discuss the score in any further detail; it is so wildly unconventional that, by design, it escapes easy classification or description. I will say that the sound quality is absolutely fantastic, probably a result of the music’s largely digital creation. Not only is every sonic element crystal clear, the stereo channels perfectly utilized, but there are also vast amounts of depth and nuance to the sound, little details here and there flitting about in the background to enhance the soundscape. You will want this soundtrack in the best quality possible - $14 on the Nine-Inch-Nails store for lossless (1400+ kbps) is an absolute steal – and you should listen with the best headphones possible. I have studio headphones, and the effect is simply incomparable. What more can I say? Trent Reznor and Atticus Ross have crafted a masterpiece here. I say that in full confidence without having heard the music in its cinematic context – this soundtrack is so phenomenal that it works as a standalone piece of music, separate from the film. Once again, I will put the caveat out there that the music won’t be for everyone – if you like your instrumental tracks to stick to a symphonic setting, then this isn’t you cup of tea. “The Social Network” score should be a good litmus test. If you enjoyed it, you will enjoy this even more. If not? Stay away. As for me, I couldn’t be happier with the results. Reznor and Ross took everything they learned composing “The Social Network” and brought their skills to a whole new level, crafting not just the best score of 2011, but arguably one of the defining pieces of modern film music. I wouldn’t be at all surprised to see “The Girl With the Dragon Tattoo” – the film – end up on my year-end top ten list on strength of score alone. “The Girl With the Dragon Tattoo” hits theatres December 21st. The soundtrack album, reviewed here, is available digitally as of today, and will be released on CD on December 27th. Thank you for pointing that out! It is indeed a covr of a Bryan Ferry song. This is what happens when I don't do my research. I will fix it when I get back to my computer this afternoon. Thanks! And yes, this score is simply amazing. Thank you for this review. You've put in words everything I feel about this soundtrack.